Most of us are no stranger to sugar. It sweetens up foods and makes it so yummy and delicious that it becomes incredibly easy to over-consume. Sugar has been said to be as addictive as cocaine, and it’s no wonder with its intense sugar high that actually releases serotonin in the brain (just like cocaine), only to send us crashing down after it’s made its way through our bodies and our brain have run out of the feel-good neurotransmitters. Then suddenly, we’re right back on the rollercoaster, wanting more – just to feel good again! Sugar is and has always been my nemesis. I find myself craving it after every meal. I have a hard time limiting myself to only one sweet treat a day, and that still isn’t the half of it. Sugar shows up in so many processed foods, it’s nearly impossible to not consume sugar on a daily basis. While sugar in moderation is usually not a bad thing for most of us, going overboard and having that extra slice of german chocolate cake and can start wreaking havoc on not only our physical health but our mental health too! Too much sugar can cause Diabetes. Percentages across the nation are rising daily for those who are affected by diabetes, and even kids as young as 11 and 12 are now contracting the disease, all thanks to our culture’s high sugar consumption. Eating excess sugar can cause Fatty Liver Disease. Like alcohol (which also contains sugar), the liver has a hard time processing too much sugar and fatty liver disease can result if sugar is not consumed in moderation. Consuming too much sugar becomes Stored in the body as fat. It’s no secret that eating too much empty high-calorie sugar will add weight to our waistlines. Studies have shown that too much sugar consumption may affect your brain activity! Sugar makes it harder for the brain cells to communicate with each other. It has also been shown to cause damaged synaptic activity in the brain as well. Excess sugar can also cause neuron inflammation in the brain which can result in depression. The overuse of sugar has also been shown to cause anxiety, mood swings, brain fog, and fatigue. Too much sugar in your daily diet has been shown to cause inflammation in the skin. Excess sugar consumption also breaks down collagen and elastin in the skin, increasing wrinkles and fine lines and making skin appear older overall. Easy daily changes to make to consume less sugar. Eliminate soda or change to diet. Pay more attention to labels. Sugar is in nearly everything from your breakfast cereal to bread! Pay attention to how much sugar is in the products you are buying and swap out high ticket sugar items for foods that contain less of the sweet addictive stuff. It’s always a good idea to stick to whole foods, as processed foods are some of the highest sugar-laden products out there! Swap out the sugar in your morning coffee for a non-sweetened creamer or use Xylitol. 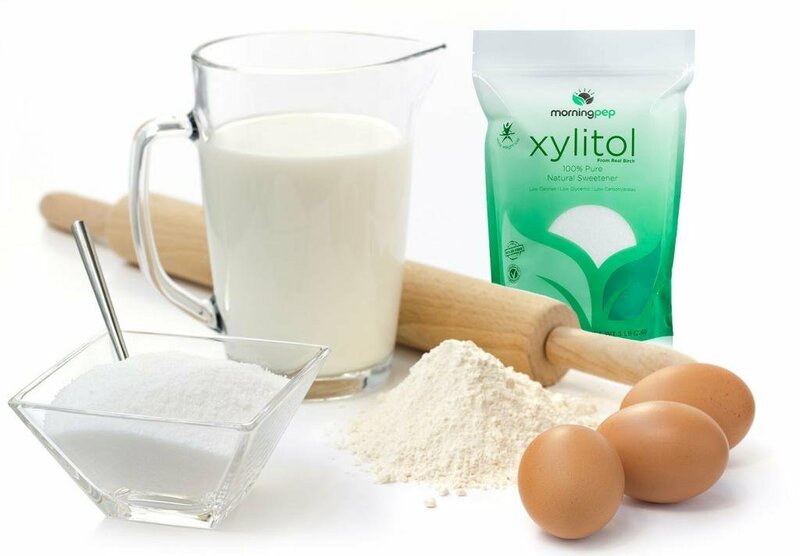 When baking and cooking at home, use Xylitol instead of Sugar. Xylitol is a natural sweetener that looks and tastes just like sugar, but without the aftertaste, you find in artificial sweeteners. Morning Pep xylitol is 100% birch extracted, not made from corn or other fruits, made here in the USA, and has 40% fewer calories than sugar too. It’s also low-carb, kosher, free of Gmo, corn, wheat, gluten, soy, and dairy, and it’s safe for diabetics too. Just like many things in life, moderation is key. While most of us don’t have to completely give up all yummy, sweet treats, begin paying attention to just how much sugar you’re consuming on a daily basis and try to keep it below the American Heart Association’s recommendation of 37 grams for men and 25 grams for women. Use xylitol where you can to substitute for sugar, and maintain a healthy diet of eating more whole foods and less processed sugary ones.